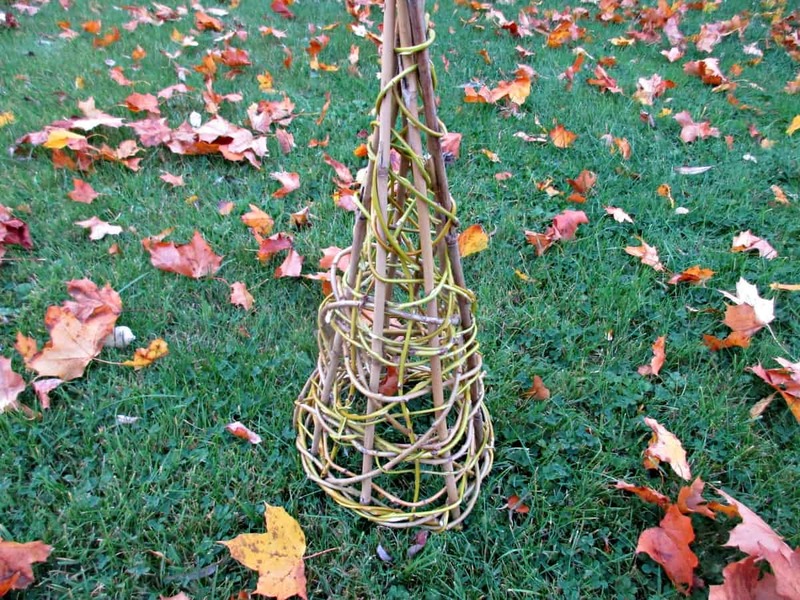 This willow cone is simple to make and could be used as a base for all sorts of crafts as well as making a wonderful, rustic plant support for the garden. We started by cutting lengths of this year’s growth from our Weeping Willow. You can see from the photos that the bark is still a wonderful mix of yellow and green. We stripped the leaves from what we had cut, leaving us with lengths that were approximately 1 – 1.5m long. This year’s growth is still very pliable and easy to use, earlier in the year we cut some and used them to make these rustic willow balls, which we used as bird feeders and our simple willow wreath. 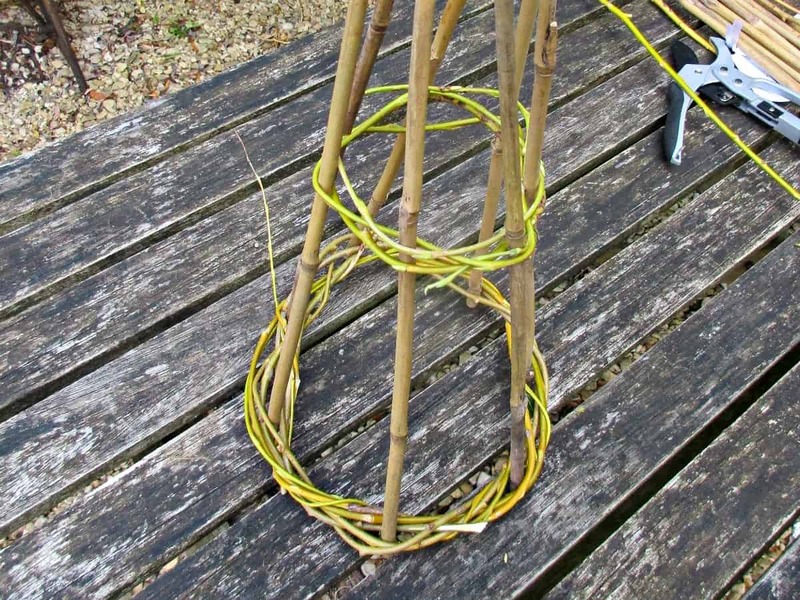 We started by weaving a simple willow ring, following the same method as we used for our willow wreath, but this time only using 3-4 sticks of willow. We then inserted our uprights – we used bamboo, as we had it available, but you could use any stick which is stiff enough to hold its shape when you weave the willow around it. Although the first photo shows us using 6 uprights, once we started weaving the willow around them it became clear that you needed an odd number for it work, so we went back and added another one in. 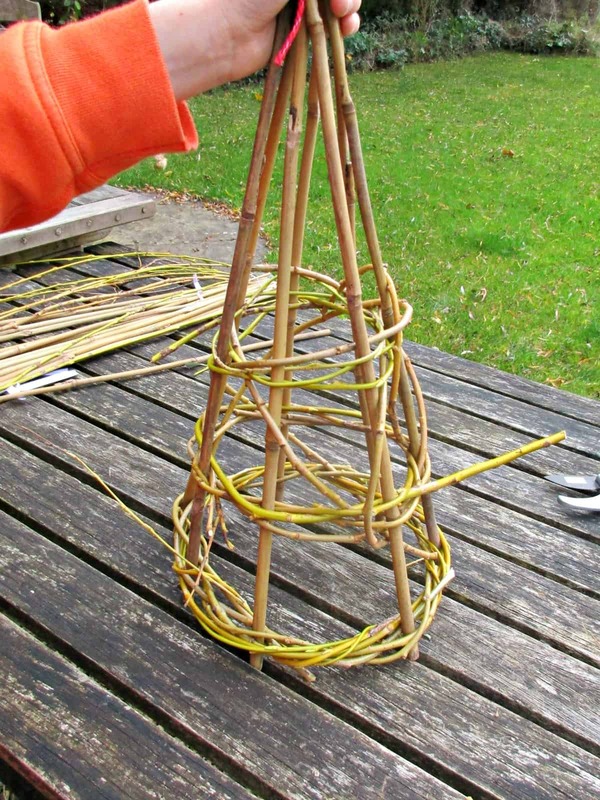 We also found it easiest to tie the top together to hold the cone in shape while you weave the rest of the willow in. 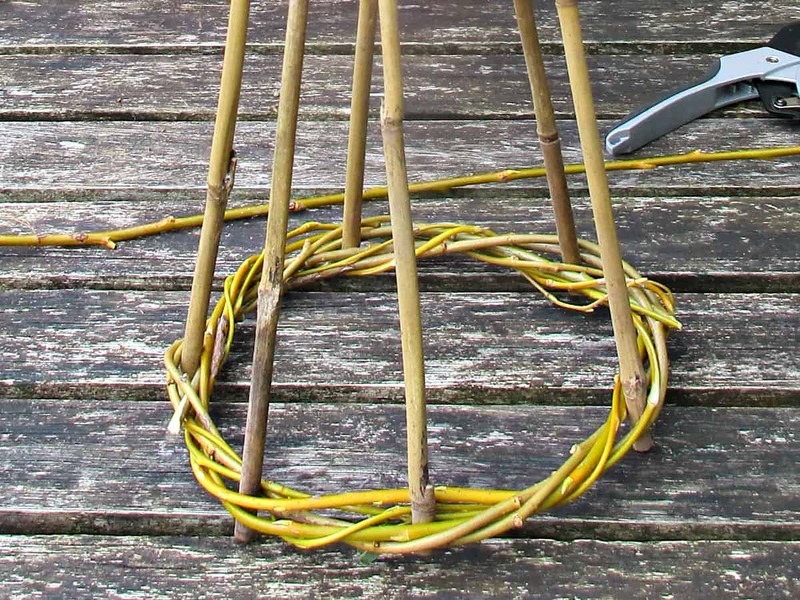 We wove a couple more willow rings into the cone shape to give it added stability, and then started weaving the willow in randomly to get the effect that we were looking for. If you wanted to use your cone as a plant support you may feel that rings are enough for you. Once you are happy with your willow cone trim off any ends to tidy it up – We left our uprights sticking out at the point to hold on to as we have a specific purpose for our cone, but you could easily trim these back too. This really is a quick and easy make, from start to finish this cone took less than 30 minutes to make. There are so many ways you could use this cone. Perhaps spray it white or silver and fill it with LED Lights for a rustic centre-piece. Decorate it with ribbons and wooden ornaments for a Scandinavian feel, or simply use it in the garden as a wonderful, natural plant support. We know exactly what we are going to do with ours, and look forward to sharing what we make in our next tutorial. To see what we did with our rustic cone check out our Succulent Christmas Tree post. Oh how neat! These would be great for my climbing garden plants. They would just need to be a little taller. Sure wish I had a willow tree. 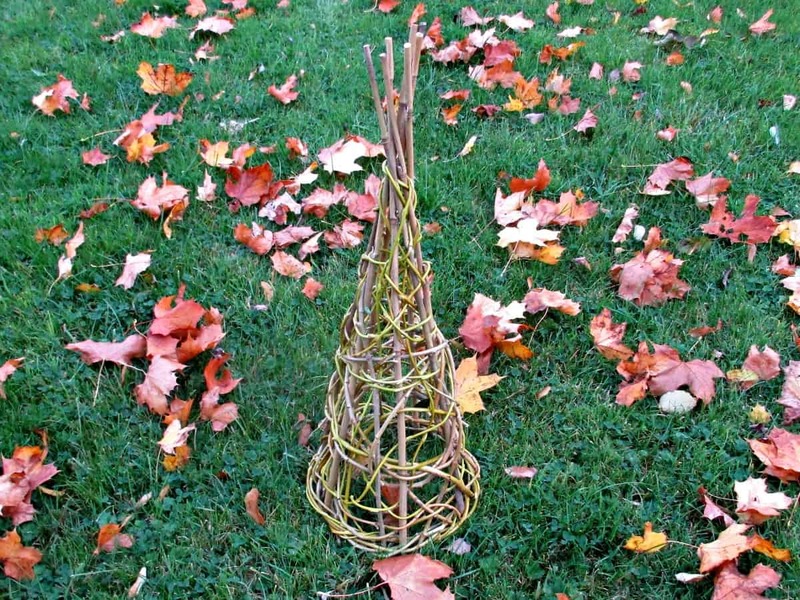 Would love to make these and your willow ball .